Before you continue reading today's entry, May i suggest that you take some time to sign up a petition to save Bukit Kiara Here. If you do not know why you should be doing it, that is great, now read on. Kiara Hill has changed within the past 3 month. The changes were scary and unwarranted. Most of you that follow my blog would know my love for this hill that is within running distance from my home (previously in Damansara Perdana and now in Damansara Utama). Wifey having legit fun in the jungle. No words can ever tell of my frustration and anger with what that has happened to Kiara. Perhaps i should start today's write up by showing a photo taken on February 4, when i lead a group of runners into Kiara. Towards lookout point from Simpang Lima. February 2012. Pay attention to the two rubber trees on your left. What used to be able to fit only three runners shoulder-to-shoulder has since turned into a "highway" able to fit more than 3 runners. It is sad to see the level of destruction that has happened. The exact same route to lookout point. Take note of the rubber tree on the left for verification. The taller thinner rubber tree on the front has been removed.. I am not lying when i say the destruction is immense. Sad day indeed. Myself, being regular in Kiara, was lost when i came down from Dirty Deeds. The level of destruction was as bad, if not worse. Here, a photo of my long time buddy Jimmy (which i have not seen since 1998?) doing a jump at the bottom of Dirty Deeds. It was a small detour than the usual landing. You can already see the level of clearing at this point that was previously green! 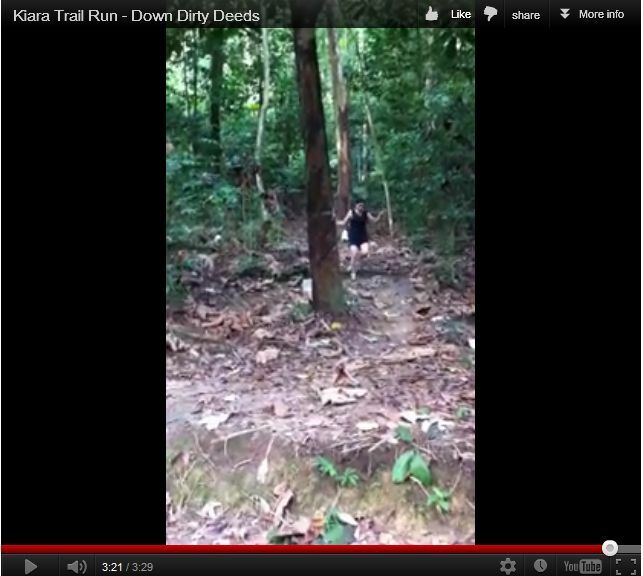 Now, compare it to the screen capture below, that has wifey running down towards the end of Dirty Deeds. What has happened? Bukit Kiara is being raped as i am writing this at 1:47am on May 28, 2012. We first noticed how Magic Carpet route (one of the many trails in Kiara) was slowly having a portion cleared and anti-climb fencing was erected demarcating the "boundary" between what belongs to some developer and the Kiara Hill proper. Not very Magic for long. If "dissappearance" is magic, then the developers are doing a great trick. Only thing, these trails ain't gonna come back anymore. These anti-climb fencing - known by their moniker as "The Great Wall of Kiara" has been erected non-stop over the months and threaten to block off/cut off/limit access for the general public that has been using Kiara Hill as their escape from the weekday hustle. Bukit Kiara is a world class Mountain Biking Trails that provides highly technical challenge for all level of mountain bikers. In recent time, Hashers made Kiara an alternative running route while more and more trail runners has been frequenting the trails as their training ground - with some using it for more demanding races such as ultra-trail runs and non-stop adventure races. Sadly, these will end soon if development continues to happen. So, if you have not sign the petition, i suggest you do so now. Petition to save Bukit Kiara Here Still not convinced? How about some images of "The Great Wall of Kiara"? Singletracks and double tracks has since been bull-dozed and flatten by heavy machineries. Greedy contractors continues to fence Kiara and they will not stop unless something is done to stop them. Soon, we will all be "locked" out. I wanted to give them a piece of my mind. But these are workers earning honest living. It is not their fault. The workers seen above have been throwing rubbish all over Bukit Kiara. The group fo trail runners collected close to 15kg of used PET bottles and other rubbish, including laundry detergent bottles! Evidence of burning (burned branches and papers) could be found along the trail of destructions. These bottles could potentially be breeding ground for Aedes and it is highly irresponsible for the developers to NOT educate their workers. But this is the least of the problem. Kiara is being destroyed and development is encroaching! From single trail to a 10-footer wide road. WHY? The cause can't act alone and the cause is asking for your help. I hope that you will now sign the Petition to save Bukit Kiara. It will take at most 1 minute of your time - but that effort could possibly keep Kiara away from developers for the next 100 years. Do your part to preserves this green lung. Join the cause. Give all these development a thumbs down! How many more will join us? Please feel free to share this blog post and raise more awareness. Do not let Bukit Kiara be taken away by greedy developers. Do not let only the RICH exploits what belongs to all level of Malaysians. Do not let them take away what has been there all these while. Do it. Sign the Petition NOW! This write up will be better if we manage to get them to stop! So sad! I already signed the petition. Excellent before-and-after picture Stupe. We need more of these, so people please snap you favourite location and landmarks, cause next time it may be mud and smoldering tree trunks, a sunny Disney Land with an off-road quad bike tearing up the turf errrr I mean replanting more trees. I have many otehr pics of the trail. Might consider to post them all up. It is time to show and compare the level of destrution that has happened and is still happening.